A week ago my three-man crew and I raced "Narrow Escape" to San Diego in the inaugural Border Run race (http://www.theborderrun.org/). It was wonderful. 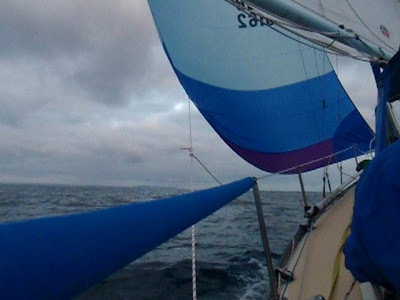 There was wind from start to finish, with a few brief lulls before midnight, and we averaged 5.1 knots. The handicap distance for the short course we raced was 69 miles, which we completed in 13 hours 27 minutes. 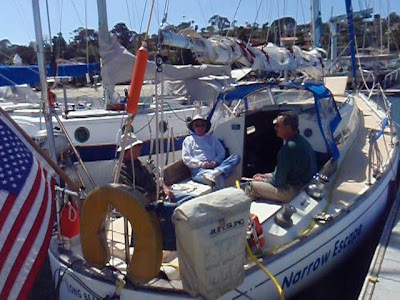 We probably sailed less than a couple miles longer than that because the rhumb line course from the start off the Newport Beach harbor entrance to the San Diego entrance buoy "SD" was generally a reach the entire way. Our competition was four other boats that finished the "CRUZ Spin C" race and we beat one of them. The Cal 27-2 that was the only boat with a slower handicap than ours, took second place. We never saw it during the entire race, a strategic mistake on my part. We got a clean start at the gun on starboard tack at the leeward end of the starting line, while most of the other boats were crowded together at the windward end, which undoubtedly blocked our view of the Cal 27-2. There were three cruising classes racing the short course and all of us shared a single start. Running the line before the gun. 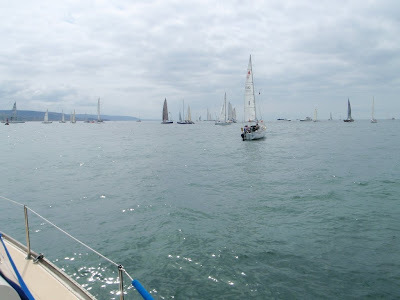 This is a new race, competing with the venerable Newport to Ensenada race, which we've failed to finish in the two times "Narrow Escape" was entered because of light to non-existent wind. 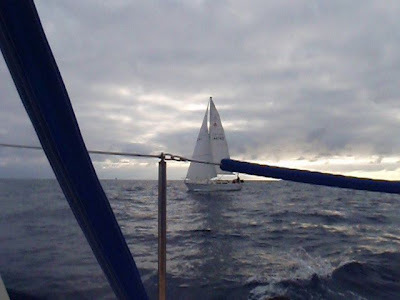 In fact, it appeared that I would not have a crew for a third attempt, so it was welcome news when word of the Border Run alternative popped up and my crew decided they would risk a shorter race. A Columbia 50 passes quickly. There was some acrimony between the two race organizers, which can be found with web searches, but in fact, they coexisted nicely and both races enjoyed great wind and nearly all entrants in both competitions finished. A record pace was set in the Ensenada race. And Randy Reynolds, the force behind the Border Run alternative, was first to finish the same short course we raced, in a blistering 6 hours, 7 minutes, 36 seconds on his Reynolds 33 turbo catamaran. Nate Tucker at the helm. 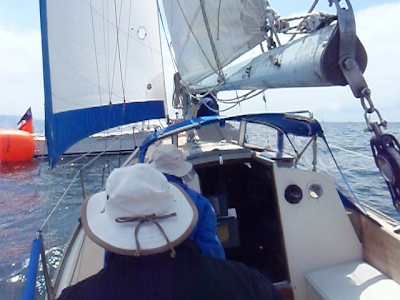 We slowly pass a Catalina 30 - but it is racing in a different class. During the Friday evening lulls we hoisted a gennaker, which we had not previously used, and were delighted with the 1-2 knot advantage it gave us over the 155% genoa. But when the wind freshened and stayed that way after 11 p.m., the gennaker was overpowering and proved difficult to take down. Had we ever practiced with it, we would have been able to unroll the genoa in front of it and then peel it down and under the gennie. But I feared something would go awry in the dark and we'd end up with two intertwined sails or pairs of sheets and be in trouble. So we brought in the gennaker accompanied by a lot of commotion -- ours and the sail's -- but no permanent damage to sail, gear or egos. It probably cost us 10 minutes. But we lost to the next fastest boat by 18 minutes and 10 seconds on corrected time, so we didn't defeat ourselves. 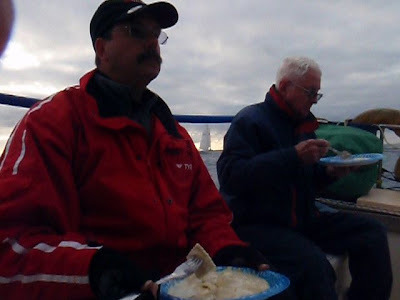 The gennaker gave us better speed but was hard to douse. We spent a comfortable two nights at Southwestern Yacht Club in San Diego's Shelter Island basin, where we arrived about 3 a.m. Saturday morning. 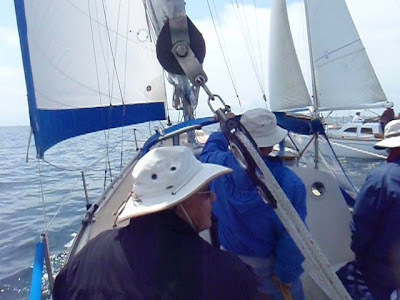 On Sunday we motorsailed to Dana Point in about 11 hours and a marina guest slip Sunday night. The motorsail home to Alamitos Bay Marina in Long Beach was another six hours on Monday. The Tohatsu 9.8 hp outboard performed flawlessly, consuming no oil and only about 15 gallons of fuel, including the four hours of motoring to get to the race course Friday and cruise around awaiting the start. Relaxing Saturday in San Diego. 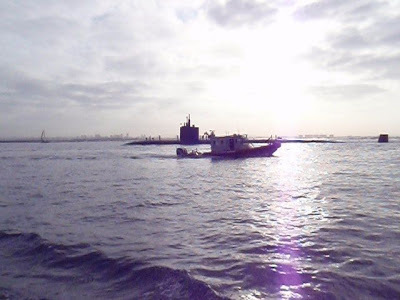 Coast Guard makes sure we stay away from Navy submarine returning to base Sunday morning. 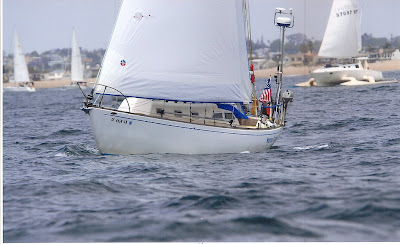 The Ericson 30 is a comfortable and easy boat to sail, even if it isn't particularly competitive in PHRF handicap racing, at least under my leadership. It has been 11 months since my last posting on this blog. Much of that absence is because I have been working disaster recovery assignments for FEMA rather than sailing. That includes time in Des Moines, Iowa for historic floods last summer, Baton Rouge, Louisiana for Hurricanes Gustav and Ike, and here in California for the wildfires of last November. 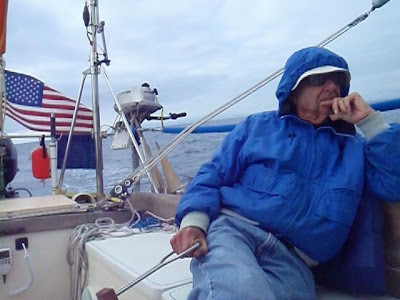 I'll probably be deployed again soon, so there likely will be another gap in my sailing ruminations. But when I have more to share, I'll be sure to post it.